Fact or Fiction – the Missing Link? Why is it that man spends so much energy and uses every resource available to discover the origin of the universe and the origin of his own species? These are two burning enigmas that have puzzled mankind over the centuries and continue to do so today. Modern science has revealed discoveries that could never have come about without the use of computers; the Hubble Telescope 350 miles out in space is one such marvel dependent upon computers. According to empirical knowledge based on the speed of light, images of galaxies, exploding stars and coloured cosmic gas clouds formed 500 million years ago are recorded by the computers that process them. Last night, on BBC 1, yet again David Attenborough presented a programme supporting the theory of man’s evolution from primitive species, but unlike his programme on the 1st February, he did not make a case for denying the validity of the account of Creation given in the Bible in Genesis. Perhaps he had received flack from Biblical Creationists, or maybe he believed his case was proven so that denial of the Genesis account was no longer necessary? In last night’s presentation he showed that he was convinced the ‘missing link’ in the fossil chain had been discovered, because of a fossil found at a Hamburg mineral show in 2006. According to the theory of mankind’s evolution there is a split in the evolutionary tree that results in two branches, i.e., the branch of the Prosimians and the branch of the Anthropoids, but where is the common ancestor that shares characteristics of both Prosimians and Anthropoids? Well, according to Mr Attenborough a creature more resembling a lemur than a human is the ‘missing link’. The fossil of this animal, purporting to have been formed 47 million years ago, was made subject to intensive interrogation by eminent scientists in their fields and by the use of computerised 3-D graphics; they concluded that the creature looked almost identical to a lemur which belongs to the Prosimian branch, not the Anthropoidal branch from which monkeys, apes and humans are supposed to have evolved. Nevertheless David Attenborough presented various arguments to support his view that we humans had evolved from this ‘transitonal’ animal and that we had more in common with the fossilized creature than did a lemur. Apparently a lemur has a grooming claw on the second digit of the hind foot, but this creature named Eda for identification purposes does not; also a lemur has ‘combed’ teeth at the front of the lower jaw, whereas Eda does not. In both respects David argues she is more like us, and to press his point home he explains that the shape of her pelvis is similar to that of humans who walk upright - quadrupeds require a different shaped pelvis. Her hands, with inward articulating thumbs, just like humans (and lemurs), has nails similar to ours. She also has a Talus bone in the ankle just as we do, which is necessary for walking upright, but lemurs have a different set of bones. Incidentally, the same science is used to ‘prove’ that lemurs have hardly evolved over the time span of 47 million years required for the evolution of man. On the basis of the above discoveries David Attenborough believes Eda is the ‘transitional missing link’ and without it there is no conclusive proof that humans have evolved from some lower form of life. The fact that no other such transitional link has been found begs the question, ‘Is his theory proven?’ It is claimed that a unique set of circumstances accounts for the preservation of the fossil, namely the coming about of the Messel pit in Germany 50 million years ago by an underground explosion that forced molten rock upwards thereby creating a deep crater that filled with water. Eda had been drinking from its edge when she was overcome by carbon dioxide bubbling to the surface causing her to fall unconscious into the water so that she sank to the bottom where she was covered with layers of silt; hence she was preserved until this day. Have you ever seen yourself through the lens of a webcam? Well, I have, and what a shock it was. Truth was revealed just as I’d never seen it before. The stark reality of everything was there to see and hear with no escape. Rembrandt made a series of self-portraits throughout his life; therefore it was no shock to him when he grew old to observe exactly how he looked, but for me to behold a ‘movie’ portrait of myself as a septuagenarian, without seeing transitional renderings of my appearance through the lens of a webcam, the experience was more shocking than I imagined it would be. Yes, I’ve looked at photos of myself and encountered reverse images of myself in the mirror almost every day of my life, but they did not prepare me for the impact of a moving three-dimensional webcam image. The camera doesn’t lie, so the saying goes, but a two-dimensional static image only bears some resemblance to the source; whereas animated three-dimensional images render the truth more accurately. If you want to see yourself as others see you, perhaps the best way is to watch a video clip, because the camcorder or digital camera will accurately record details you would rather not want to see, even if you know about them or subconsciously put the facts out of your mind. After watching the video clip you have a choice - you can face up to the truth and accept what you see, or you can attempt to put the truth out of your mind. Even if you delete the video clip, the truth cannot be changed and perhaps the best option is to thankfully accept it. The majority of people die intestate; that’s to say they do not make a will. Such a situation brings difficulties for those left behind when the tragic moment comes perhaps unexpectedly, particularly for a spouse or close relative because they are left with the tasks of sorting everything out. If my own attitude until recently about making a will is the common one, then I would suggest you urgently reconsider the priority of settling your affairs before it is too late! Who’s to know when you will die? Only God has the answer. When you are young you feel invincible; you are fit and vigorous and in your mind life stretches out before you. Death is a long way from you beyond a distant horizon. You believe there’s nothing you can’t do or achieve if you put your mind to it. Well, that’s what you think. At the age of forty you are told you have reached the top of the hill and maybe you feel it - you are on the downward slope to senility and inevitable death, and yet you reason, “Well, that’s a long way away, another forty years to go perhaps.” Your mind blots out the inevitable and you forget to reason that death could come at any moment – there’s no urgency for making wills. It wasn’t until I heard this from the Elder that I suddenly realised how important it was for me to make my will - after all, I am well past the biblical allotted time for a soul to live on earth. The Scriptures give us, ‘four score years and ten’, and sets out the exception that only ‘by reason of strength’ does a man live longer; yet we know also from the Bible that man lives for as long as God determines. The Elder went on to say that he appreciated it greatly when the wishes of the deceased had been set down in writing, particularly with guidance as to what should be included in the funeral service. I gave this much thought and resolved to write a will and record what hymns and scriptures I would like for my funeral. What I didn’t expect was the attitude of mind I would acquire during the process. I was greatly humbled and profoundly thankful for the life that had been given to me. I became acutely aware that every minute of it is precious as the seconds tick by. Another unexpected result of the exercise of writing a will and setting down what I want included in my funeral service was a grieving for the imaginary loss of those near and dear to me because they would no longer be with me. Of course, in truth, I shall never experience such a loss, because I shall be with my Lord in life beyond death. As I thought of these things I was awestruck with the power of God, His goodness and love. Not only for the practical value of writing a will and preparing for ones death, but for the benefit of gaining an insight into the value of life itself, I would recommend everyone to prepare for the inevitable by taking pen to paper and setting down in black and white your wishes. There is no greyness in the future beyond the grave, only black or white – which do you choose? Do you opt for the searing whiteness and brightness of the glorified Christ, or the loneliness found in the utter darkness of everlasting death? This an attempt at uploading an article by using my mobile phone. If you are reading this I have been successful. I understand that I can upload to my blog by using email and it's even possible to add photos too by attachment. So this is my attempt at making it work. 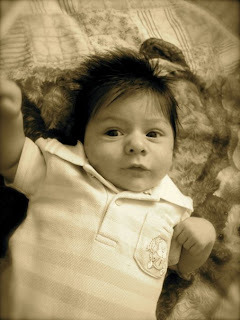 I am hoping I can add a photo of Jadon, my most recent great grandson, the son of Natasha and Dominik. Edit Note: Well, it actually worked. Desires that become lustful passions* can overpower our fundamental instinct of survival if we indulge in them so that our cravings gain the upper hand, causing us to lose self-control to the extent that our health, both physical and mental can adversely be affected. Overcoming even a singular lustful passion played out in practice can require a high degree of mind control on our part. When we are engaged in our lustful pursuits our survival instinct is subjugated or entirely ignored because of the intense action involving our mind and perhaps our body, and yet, without our survival we cannot fulfil our cravings. We become a bit like a parasite that depends on the body upon which it feeds, but ultimately destroys that same body. Cunning advertisers bombard us through TV, the Internet and by other means with attractive temptations by way of suggestions or offers designed to satisfy our desires, wants or needs; therefore the utmost vigilance is required to over-rule and filter the incoming information which may mean ignoring or putting out of mind what the eye sees or the brain hears. It’s a matter of keeping a balance without excess; for what the mind lustfully desires must be subjugated in order to maintain equilibrium. Any disproportionate desire for a particular thing is a recipe for disaster because it acts like a compulsive drug upon which we become addicted. Do we want riches? Do we want good health? Do we seek pleasure or do we want chocolates? Our wants can become so demanding that they escalate into ‘must haves’ without limit, at which point they become cravings for the satisfaction of our lust. The continued practice of our lust can eventually destroy us so that we become slaves to whatever we crave; then we’ll abandon the morals and principles that originally shaped our being; we’ll no longer be the balanced person we once were. A taste of amphetamine leads to a taste of ‘Crack’, and a taste of ‘Crack’ brings a desire for heroin which paves the way for a cocktail of drugs that leaves us sprawling on the floor where we die a wretched death. So beware; be vigilant and control the mind that brings desires for those things that may eventually destroy both mind and body. Maintain equilibrium and never be excessive. If you can be satisfied with what you have, you’ll never fall into the temptation of lustful desires. * Within the context of this article ‘lustful passions’ are defined as grossly excessive longings for a particular thing or experience which may include over-indulgence in sexual activity.